Hotels Acireale, Italy - Reservation guide of Accommodations and Hotels in Acireale, Italy. Acireale is a seaport center on the east coast which overlooks the Ionian Sea. The city is set on a large plateau of volcanic origin overhanging the sea. In recent years the town has also extended along the coast, while the surrounding area is cultivated mainly in citrus. The city is immersed in a wild nature, midway between the Etna volcano and the sea. The urban plant has the typical baroque structure and the center is the Piazza del Duomo, on which overlook some of the most famous buildings of Acireale. A Greek myth tells that the city was born from the union of Aci and Galatea, a mortal and a nymph, but according to historians it has much more ancient origin. Throughout history Acireale has changed several names. The Sicilians called it Xiphonia, the Latin name was Acis Aquila, until 1642 when the king Philip IV gave its current name. The '600 was certainly its golden age, during which were built many monuments of the old town. The town still preserve the forms of Sicilian baroque, clearly visible in buildings, homes, churches. The most interesting monument is the Cathedral dedicated to Maria Santissima Annunziata, whose original dates back to the fifteenth century. The facade is in baroque style and it is flanked by two gothic towers. Inside are preserved various works of great value created by local artists. In the same square there are the Church of Saints Peter and Paul and the Palazzo Comunale. The Corso Umberto is the main street of Acireale, with some beautiful shops, clubs and restaurants. In the southern outskirts of the city there is the Santa Venera spa, opened in the nineteenth century in an area rich in water sources with special qualities. The All Seasons Catania-Acireale is a three-star hotel in Acireale on the Sicilian sea. The location allows easy travelling to the international airport. All the Seasons Hotel rooms have free wi-fi and TV, as well as air conditioning. Free car parking. Excursions nearby and water sports are highly recommended. The Orizzonte Acireale Hotel is a four-star hotel in Acireale, near the sea and the historic buildings of the town. The guests will feel great emotion in eating at the restaurant on the rooftop terrace. The Orizzonte Hotel rooms are comfortable with air conditioning and free wi-fi. A pool and an outdoor sundeck are available. The Maugeri Grande Albergo is a four-star hotel in Acireale, in the heart of the town and overlooking the sea. The hotel rooms are equipped with TV and free wi-fi. The hotel also offers its guests a restaurant and a lounge bar. Acireale's Cathedral is worth a visit during a stay at the hotel, while it is easy to get to Catania by car. The Antica Conceria is a three-star Hotel in Acireale, just outside the city centre and well situated to reach the sea. It is equipped with many facilities, including the restaurant and a spa. 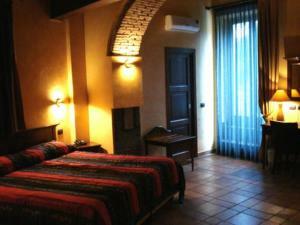 The rooms of the Antica Conceria have satellite TV and wi-fi. From the balconies it is possible to admire a beautiful seascape. Choose the hotel best suited to your healt! Look for hotels in Acireale with a swimming pool. a beauty farm or hotels which offer fitness packages in Acireale. Select hotels with Turkish bath, whirpool bath, jacuzzi, sauna and solarium. Are you looking for a hotel close to Acireale Spa? Select your hotel according to the distance from the termal baths! Hotels with parking in Acireale ? If you have decided to travel to Acireale by car or motorbike, don't worry about finding a parking space or leaving your vehicle unattended. Display the list of hotels and accomodation in Acireale provided with a parking place or a garage. Book a hotel in Acireale with a parking area! Pet-friendly hotels in Acireale ? Don't leave your dog at home. Use our guide to check the list of hotels and accomodation that welcome dogs in Acireale. It is also possible, from our selected list of hotels and accomodation where animals are allowed in Acireale, to keep your dog in the room with you! Check our offers of hotels and accomodation in Acireale with rooms equipped for the disabled! For your stay in Acireale, book a hotel accessible to disabled people. Choose your hotel in Acireale from the list of hotels equipped to welcome disabled people! Wi-Fi hotels in Acireale ? Are you looking for a hotel or accomodation with a quick internet access and wi.fi? Click on the list of hotels in Acireale which have a wireless connection to internet and wi.fi. Gay-friendly hotels in Acireale ? Look for gay friendly hotels or gay friendly accomodation in Acireale, choose to sleep in a gay friendly hotel or gay friendly accomodation in Acireale! Take advantage of our offers of gay friendly hotels or gay friendly accomodation to book your holidays in Acireale.